Taking care of construction jobs can be simple when you have access to great sawzalls! 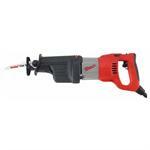 USDiamondTool.com sells exceptional reciprocating saws and a variety of sawzall blades for your needs. Whether you are searching for a new sawzall or on the hunt for a specialty sawzall blade to cut wood or metal, our business has the item you have been looking for. 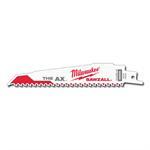 USDiamondTool.com features quality Milwaukee reciprocating saws and blades. Each of these products is built to last, can be used quickly, and are versatile. It does not matter if you are a professional looking for a saw that stands up in tough applications or are a hobbyist that needs a high-end saw to complete your tasks, these tools are the perfect selections. Take some time to look through our selection of sawzalls to find the tool or sawzall blade for you. Each of these fabulous selections is sure to help you get the job done. Materials, tooth configuration and heat treating are designed to maximize performance in specific cutting applications. These blades have a 1/2″ universal tang that fits all standard saws. The gear protecting clutch extends gear and motor life by absorbing high impact forces caused by sudden blade lock-ups. A QUIK-LOK® blade clamp offers fast tool-free blade changes.